Welcome Olympus High School Class of 2000! 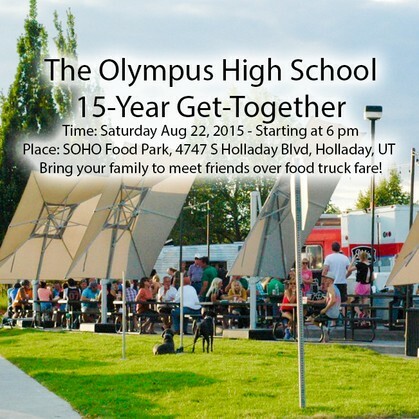 We are happy to announce an unofficial get-together happening this Saturday August 22, 2015 starting at 6pm at the SOHO Food Park 4747 S Holladay Blvd, Holladay, UT 84117 where food trucks aggregate for you to enjoy food truck fare (at your own cost) with family and friends from the class. This is an unticketed event so just show up if you can to meet up with some old classmates from high school! Aug 17, 2015: It is with dissapointment that we announce that despite our best efforts unfortunately due to a lack of response and ticket sales to date, we have decided to cancel the 15-year Reunion as it is not financially feasible to host this event with anticipated attendance to date limited to less than 20 adult individuals--an experience that would not be ideal to the attendees as well. I'd like to thank Brad Smith and his wife for their time and hard work, planning, organizing, creating the graphic art, working with parks and recreation and catering to get this set up and for the detailed analysis and group communications that he organized. Thank you to Walker Ford and Amy Swenson for their willingness to contribute to the reunion committee as well. I regret that we were not able to plan this event out further in advance as we did have difficulty mobilizing a committee this year, and apologize for the late notification of this event that may have contributed to limited response. We are discussing the option of an informal class gathering at an appointed date and time for people to meetup and socialize albeit in an unorganized fashion and will post further regarding this. All ticket sales will be fully refunded via Paypal within the next 24 hours. Here's looking to 2020 where we will take our lessons learned from the shortcomings of this year towards planning a stellar 20th reunion for both family and friends and to return to our old (and new) Olympus High School as we meet again after two decades. Until then, we wish you well.